I have combination, sensitive skin prone to redness. 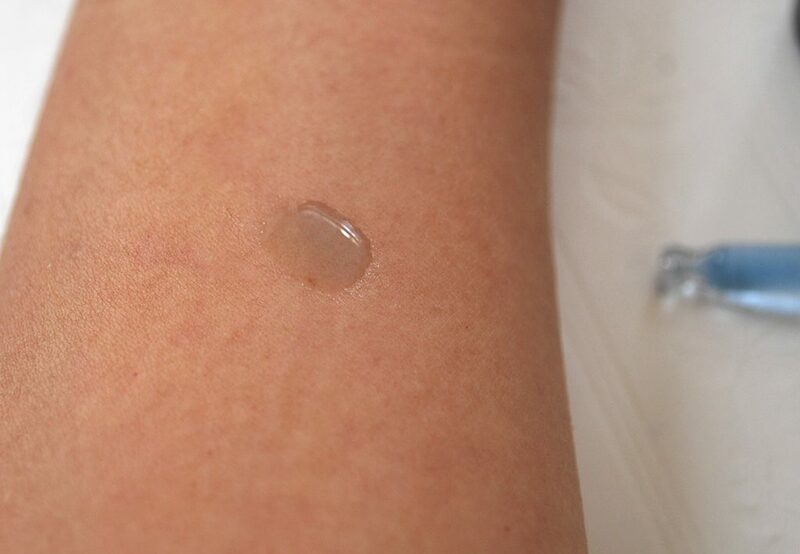 Oily sheen, pores clog up immediately, when it’s hot, small pimples appear. Pink undertone and a few capillaries close to the skin on the cheeks. Easily irritable skin, the face often turns red after a shower and when I’m nervous. Our summers are very hot, I need light products that don’t clog pores, hydrate and calm redness. It ended up being a mish mash of production from different Korean brands. With this skincare routine the skin is soothed, the pores aren’t clogged, and there’s no redness. The oily sheen is minimal, there is no inflammation even during the monthlies. 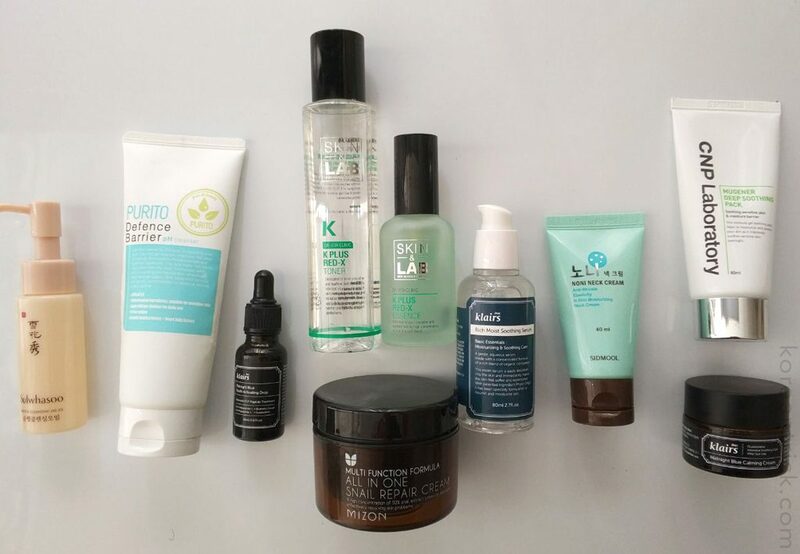 All of these products are also suitable for couperose prone skin. Balancing cleansing gel for sensitive skin. It supports skin’s defence barrier thanks to the low pH (5.5). Has a very faint scent of tea tree oil, one could say it’s basically scent free. But the main thing is it doesn’t dry or irritate the skin after cleansing. Alcohol free vitamin K toner for sensitive skin. The toner in this line is liquid, colorless, with a very faint and pleasant scent. Usually I pour a bit of toner in my palm then apply to the face. I use 2-3 layers of toner for the best hydration. The toner gets absorbed instantly, gets rid of post-wash dryness, soothes and prepares the skin for the consequent hydrating steps. The face is fresh, hydrated, and the skin is calm. It does everything that I want from a toner. After it all other hydrating products apply easier and get absorbed quicker. Contains vitamin K3 which helps reduce irritation and spirulina – blue-green seaweed whose extract protects from the redness causes such as dehydration, pollution and sun radiation. Just right for my finicky pink face. Essence with a gel-like delicate texture, two pumps are enough for the face and neck. 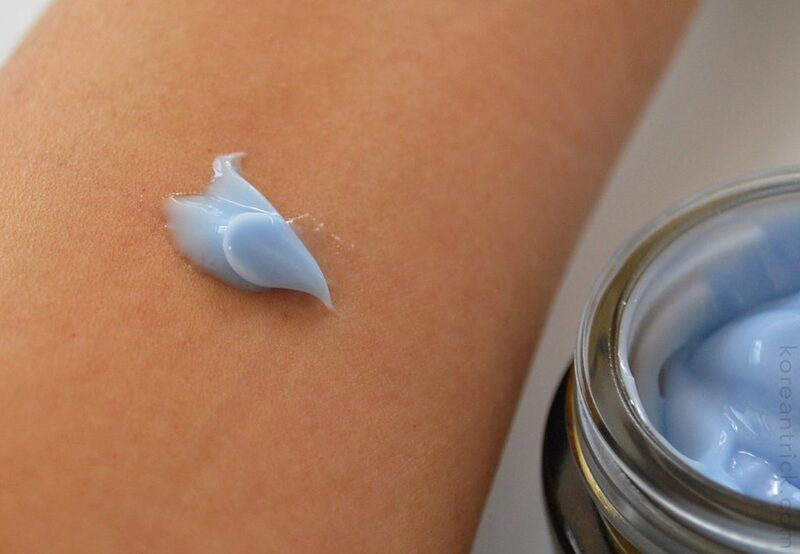 Gets absorbed very quickly, without stickiness or shine. Leaves behind a feeling of freshness, soothes the skin and even cools the face a bit, even though menthol isn’t in the ingredients. The effect is cumulative. The soothing effect was noticeable right away, and the redness reducing effect after one to one and a half weeks after starting to use it. The skin became calmed and the tone more even. But the redness didn’t go away completely, of course. But the cheeks are not as bright after a shower. A great essence for sensitive skin of any type, it’s not greasy and isn’t felt on the skin. 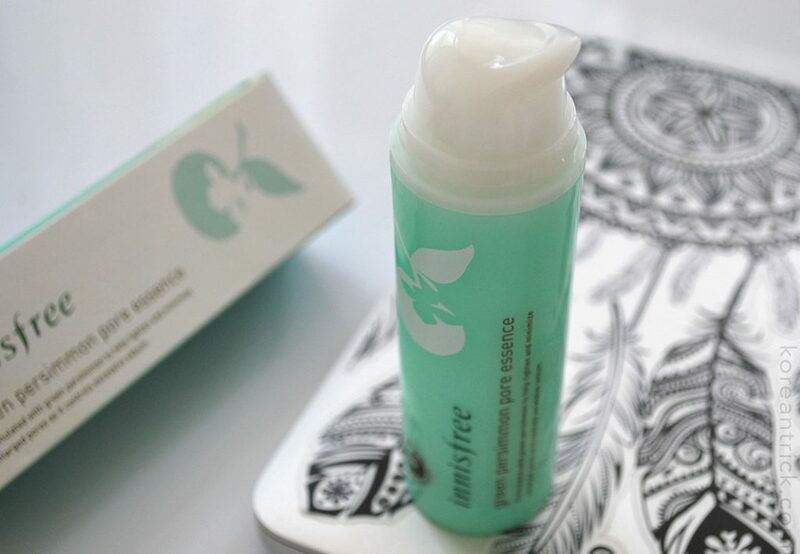 Contains green persimmon extract from the Jeju island for hydrated and smooth skin. I think this essence will work for any skin type. It’s easy to apply and it gets absorbed completely. It’s incredibly light and doesn’t leave any residue on the skin. It can be used morning and night. I typically use it only in the morning. With it, the t-zone gets oily much less. The scent is amazing, citrus fruits with bitter herbs and greens. 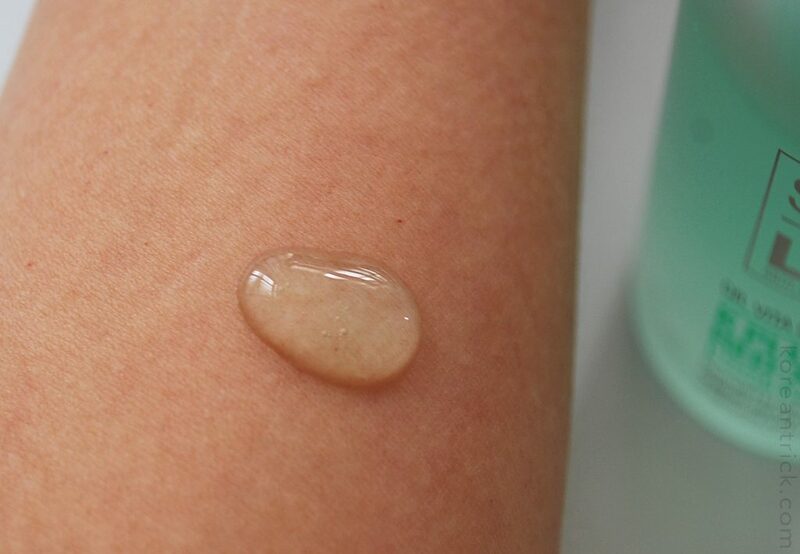 Effect – the skin is much less oily during the day. The pores are not clogged, the skin is smooth and pleasant to the touch. For hydration in the morning, a couple layers of toner and two essences are enough for me. I don’t like too many layers on the skin; I do not use creams in this heat. Lifting neck cream with niacinamide, hyaluronic acid and Noni leaf extract. When I first opened the tube, I thought it was too light for my skin. The consistency is of an airy emulsion. And I’m used to thicker and more nourishing neck products. But this baby surprised me. The most important step of the summer (and not only) care, especially in a hot climate. I have two sunscreens and I use them depending on my mood. This sunscreen has 4 filters, two physical (Zinc Oxide, Titanium Dioxide) and two chemical (Octinoxate, Octisalate). Protects from UVB, UVA2 SPF 50+ PA+++. This is maximum protection even for the pale skin and skin prone to pigmentation. A white thick cream but gets absorbed quickly and leaves almost not white cast, just makes the skin a bit lighter. Doesn’t pill, doesn’t melt in the heat, sweat resistant. Doesn’t clog the pores. The second sunscreen for troubled skin. Sebum control cream with an unexpected effect. It illuminates the skin, adds a shimmer and a moist shine. Korean women really like this effect. Even though I love matte skin, strangely I like this cream. A bit of powder on top and you get a very fresh looking face. Powder has a matte finish. Fine grind, applies well, doesn’t whiten the skin if you don’t apply too much. A required cleansing step if you use bb creams, waterproof makeup, sunscreens and if you have easily clogged pores. Cleansing oil will perfectly cleanse skin and pores. Currently I have a luxu brand in small bottles of 50ml. It’s excellent and smells like pine nuts. The skin afterwards is very soft, pores are clean, takes off any makeup and doesn’t sting the eyes. One pump is enough. I massage dry skin with this oil for a couple of minutes, then wet the palms and massage another minutes. I was off the remains with a foaming cleanser. 2. Purito cleansing foam. Same cleansing foam as in the morning. I’ll be 40 soon and I finally decided to include a peptide course into my routine. This is a night anti-aging serum, which is used before bed. It has to be applied as the first step right after cleansing. There are 10 ingredients without the use of purified water, so this is a very concentrated serum. 95% of all ingredients are anti-aging. The blue tint comes from guaiazulene. A dark glass bottle with a dropper. 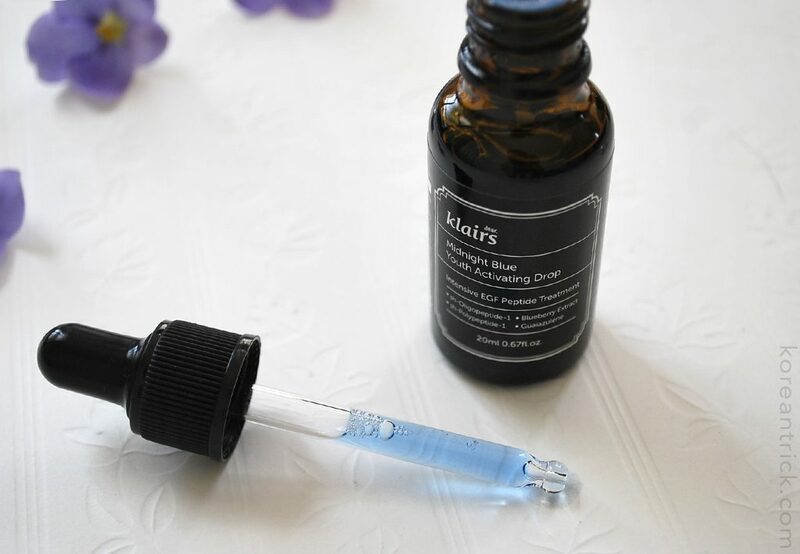 The serum has a bright blue color. The consistency is very runny, like water. I drop it right only the skin, because it runs off of the fingers. 4-5 drops are enough for the face and neck, and I also apply it to the eyelids. It gets absorbed immediately without a trace. This is the first Korean cream that I have ever tried. A favorite for the summer. It tightens pores, smoothes the skin, gets rids of an oily shine, heals pimples. A total must have. When it’s hot, I simply can’t go without it. It doesn’t suit everyone, but if it works for you, you won’t trade it for anything else 🙂 I apply it before other hydrating products (two essences, I don’t use toner), because it is slightly astringent. I use this cream every other day. 5. 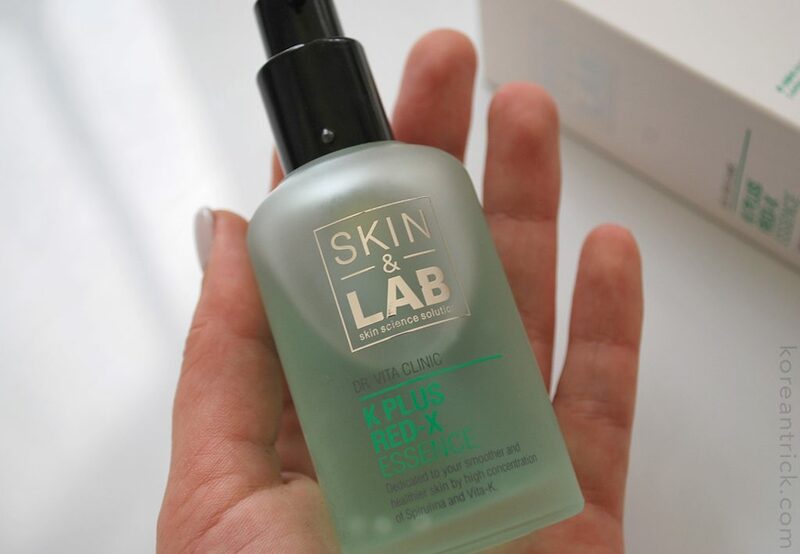 SKIN&LAB K Plus Red-X Toner. The same toner and essence as in the morning. Intensive hydrating and soothing serum for sensitive skin. Great ingredients, absorbs and hydrates well. Gel consistency, practically without a scent. 7. Neck Cream Sidmool Noni. Same neck cream as in the morning. 2-3 times a week over the rest of the routine. Mask based on madecassoside, which is used to treat long-term hard to heal wounds and skin diseases. It normalizes capillary permeability and has anti-inflammatory effect. Has antioxidant and regenerative effects and strengthens capillary walls. A great light mask, not sticky, the skin is smooth and nourished in the morning. Azulene sleeping mack. I use it all over the face once a week, after a peel. Takes off any redness and irritation after peels, hair removal, sunburns and physical pore cleansing. 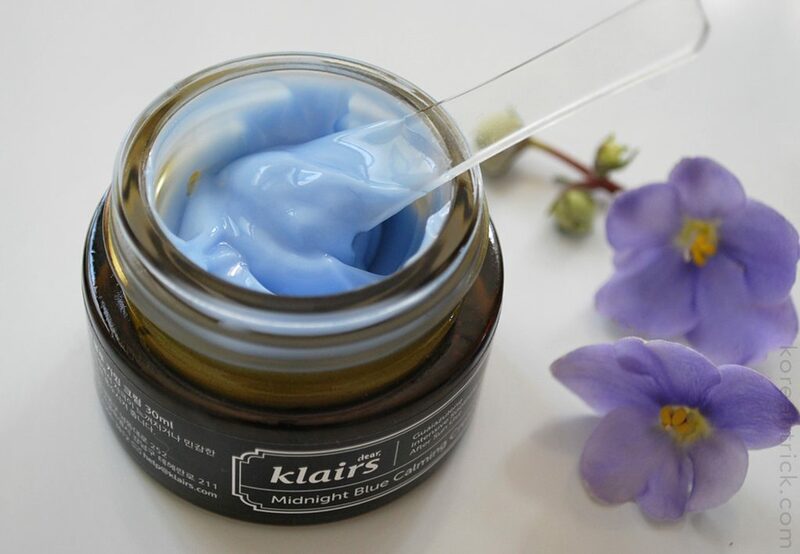 A calming, antibacterial and hydrating Klairs Midnight Blue night cream for skin that has constant inflammation and sensitivity and reactivity to makeup. A small 30ml jar, but it’s economical. I recommend it to those with very sensitive skin. But it’s not very budget friendly for its size. prev postKorean sleeping packs. How to choose one?